US, 1938, 81 minutes, Black and white. Melvyn Douglas, Warren William, Virginia Bruce, John Halliday, Nat Pendleton, Monty Wooley, E. E. Clive, George Zucco, Vladimir Sokoloff. Arsene Lupin is an entertaining detective story. Arsene Lupin is a classic character from French literature – and there were films at the beginning of the 21st century from France (with Romain Duris and Kristin Scott Thomas) with him is the central character. This is a small budget film, a supporting feature at MGM, with Warren William as a strong lead of the 1930s, even as Perry Mason, and Melvyn Douglas emerging as a star and to continue in films for the next 40 years, winning two best supporting actor Oscars for Hud and for Being There. The supporting cast is interesting, including eccentric comedian Monty Woolley as the ultimate villain, British E. E. Clive as a criminal associate, along with the dumb-ox character actor, Nat Pendleton. George Zucco is girl is the police chief and Virginia Bruce the heroine. 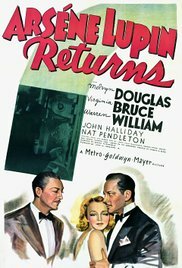 The plot involves the theft of a jewel pendant, its copy, the use of French bullets and a gun, insurance problems, moving from New York to Paris, Melvyn Douglas as Rene a romantic lead but really Arsene Lupin, reformed, so that he can marry Virginia Bruce. The mystery is solved by the two men working together. The film was directed by Geo Fitzmaurice, director of a number of films from the late 1920s throughout the 1930s. 1. A popular mystery? The tradition of the Arsene Lupin stories? And in later decades? 2. MGM production values, 1930s style, the cast, the director? The New York settings, the Paris settings? Interiors? Musical score? 3. The focus on Steve Emerson, the G-man, confrontating criminals, arrests, his reputation, the acclaim of the staff, meeting the chief, the chief complaining that his photos were everywhere, the criminals knowing who he was, that the police were not an advertising agency? His being sacked? His having the other job, protecting the jewels? 4. Going to the hotel, warning for the jewel to be kept in the safe, his meeting The count, Bouchet, Lorraine, the Arsene Lupin note, the bullet, his retrieving it, getting the authority to examine it and identify it, the gun? his pocketing the note? 5. The return to Paris? the boat, the group returning, René and the dogs, the greetings? 6. The insurer and situation, the advice to return to Paris, the limited number of days, the plan for the robbery, the insurance? 7. René, his associates, his past as Arsene Lupin, the change, his wanting to marry, his nonviolence? suave manner? Steve and his suspicions? The two former henchman? 8. The socialising, René and Lorraine, Steve and his interest? 9. The criminal, the attempt on the jewels? the police and the investigation, declaring that Arsene Lupin was dead? 10. The death of the criminal? suspicions? 11. Everybody gathering together, the explanation, Bouchet and his debts, getting the gun, his arrest? the relief for Lorraine and her uncle? 12. The pleasant work of the two men together, Steve knowing the truth, René and his revealing the truth, and signing the autograph – with Steve tearing it up? and happy romantic ending?